Payflow Pro is a payment gateway that allows you to accept online credit card payments on your Wild Apricot website. You can use it for one-time payments or recurring payments. Before you can set up your Wild Apricot site to work with PayPal Payflow Pro, you must set up an account with PayPal. Once you've integrated PayPal Payflow Pro with your Wild Apricot site, visitors to your site can pay online for membership fees and event registrations, and make donations. For security reasons, credit card information is not stored in Wild Apricot. Instead, it is securely transmitted to PayPal where it is processed. 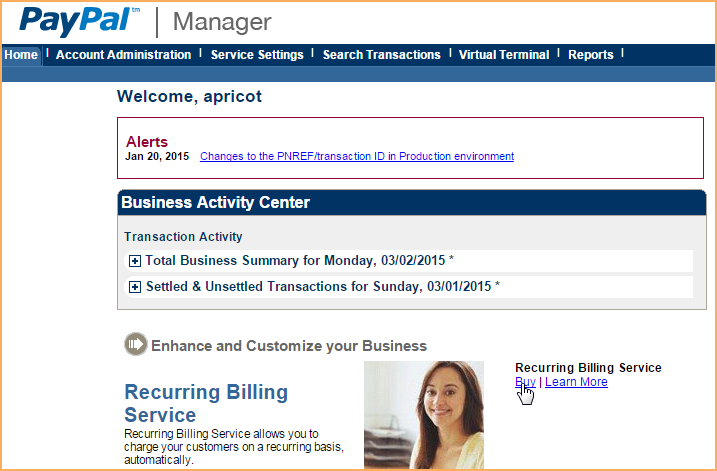 PayPal then returns the status of the payment transaction, which is recorded in your Wild Apricot transaction details. Before you can set up your Wild Apricot site to accept online payments through PayPal Payflow Pro, you must have a PayPal Payflow Pro account. To create a PayPal Payflow Pro account, click here. Once you've set up your PayPal account, you can integrate it into your Wild Apricot site. Other Wild Apricot administrators with full access privileges will be able to see your payment account credentials, so you might consider limiting administrative privilegesaccordingly. For example, you could grant full privileges until site setup is complete then remove or restrict the administrator privileges before setting up online payments. PayPal Payflow Pro supports recurring payments as a specialized add-on, available at an additional cost. If you want to set up recurring payments on your Wild Apricot site using PayPal Payflow Pro, you must sign up for the Recurring Billing Service. Once you've set up your PayPal account and Wild Apricot account to support recurring payments, you can test your settings (see below). The ID provided to you by the authorized PayPal reseller who registered you for Payflow Pro. If you purchased your account directly from PayPal, use PayPal. Your merchant login ID that you created when you registered for the account. If you have set up multiple users on your account, you'll need the ID of the user authorized to process transactions. If you haven't set up additional users on the account, then enter your merchant ID as the user. To manage users on your account, go to your PayPal account and click the Manage Users tab under Account Administration. The password you created when you registered for the account. You need to check the Enable Secure Token option, which appears within the Security Options section at the bottom of the Setup screen. Click the Payment system drop-down list and select PayPal Payflow Pro (beta). In the Partner field, enter the ID provided to you by the authorized PayPal reseller who registered you for Payflow Pro. If you purchased your account directly from PayPal, use PayPal. In the Merchant login field, enter the merchant login that you created when you registered for your PayPal Payflow Pro account. In the User field, enter the ID of the user authorized to process transactions on your account. If you haven't set up additional users on the account, then enter your merchant ID. In the Password field, enter the password you created when you registered for your PayPal Payflow Pro account. Check the Enable secure token option. Click Validate account to make sure your PayPal Payflow Pro account details are valid. If the account validation fails, check to make sure you entered the account details properly. Select the currency you want to use in your transactions. Make sure the status of your PayPal account is Test. Within your Wild Apricot payment settings, set the Connection mode to Test/Sandbox. Enter your account details, validate them, then save your changes. Log out of your Wild Apricot account, or open your Wild Apricot account in another browser. Once the payment transaction is complete, check whether a recurring profile was created in PayPal. To do so, log into PayPal Manager then go to Service Settings, select Recurring Billing, and then Manage Profiles. Check whether current payments have been enabled for the test member in Wild Apricot. 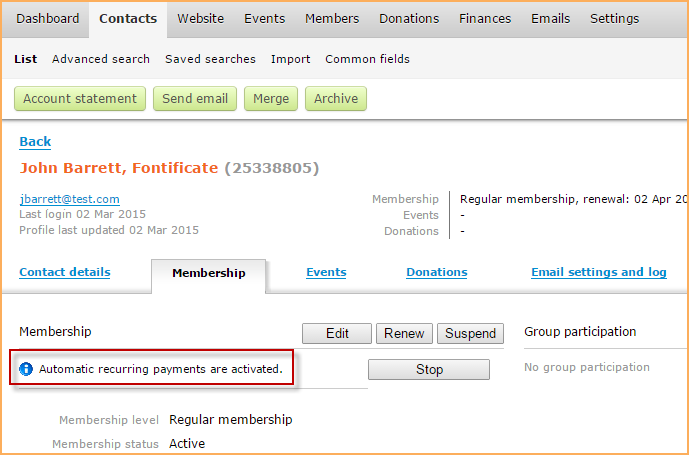 To do so, open the member's contact details within admin view and click the Membership tab. A notice indicating that recurring payments have been activated should appear. Once your test is successfully completed, go to PayPal Manager and switch the Status of your PayPal account to Live. 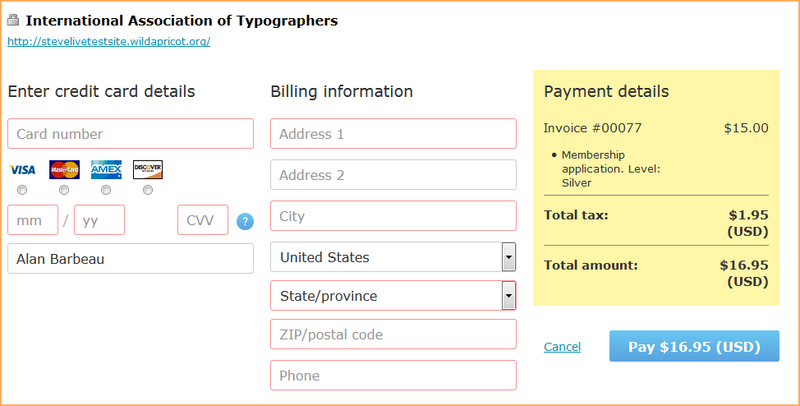 In Wild Apricot, go to the Payment settings screen and switch the Connect mode to Live. Try to run a test transaction yourself and see what message you get from PayPal. You can then contact PayPal support with exact details.